A good sales organizational structure chart enables you to know how the sales process develop at a glance. Free download professional sales organizational chart to improve the eork efficiency in your sales team. Although different forms of sales organization structure are displayed below, creating the suitable one can be difficult and challenging. 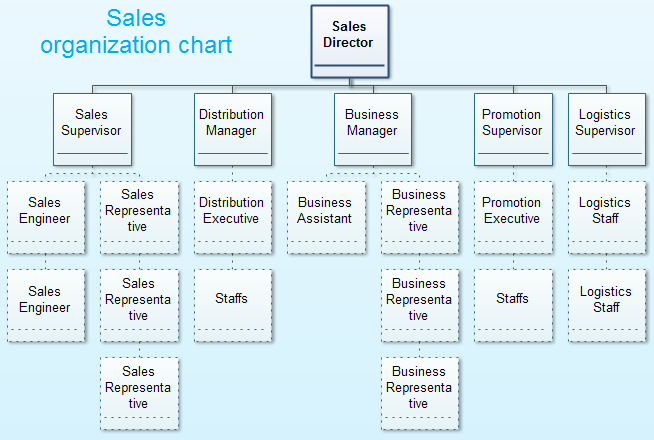 Companies can have many organization structures, but the most typical sales organizational structure consists of the shareholder, board of directors, the sales supervisor, distribution manager, business manager, promoting supervisor, logistics supervisor and employees.This following image represents a basic sales organization structure for an enterprise. The sales department organizational chart displays the most common sales structure which consists of sales manager, distribution manager, regional sales manager, sales representative, sales supervisior and channel supervisior. Refer to this chart to build your sales org chart in minutes. The sales organizational structure org chart displays the sales division with detailed information of each employee, including the name, position, department, email and work phone. 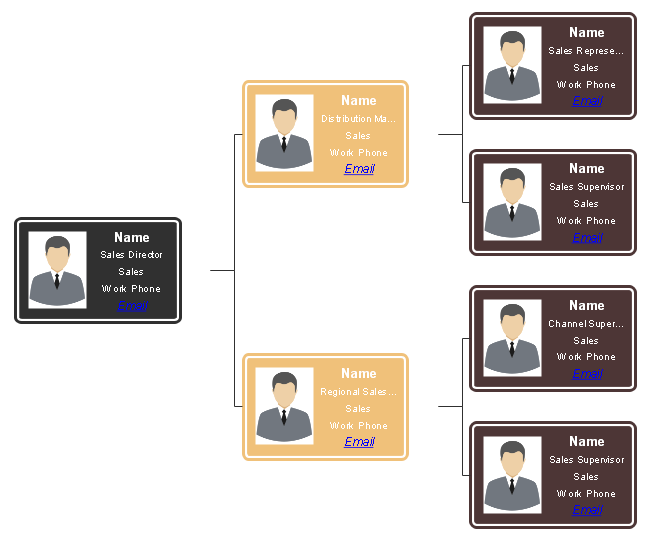 If you choose to create a sales organizational chart by importing data source in .txt, .xlsx or .csv, OrgCharting provides you with a data-interactive org chart in no time. The following organizational chart examples include student union org chart, trading enterprise organizational chart, service organization chart, hospital organizational chart, retail organizational chart and manufacturing organizational chart. Free download the example you prefer and customize it with OrgCharting to meet your sales team demand. With Edraw Organizational Chart, you can create clear and comprehensive enterprise organizational charts with no prior experience.